Well, if I get 2 posts up in a month, I consider myself quite lucky. So, is today the end of the world? After all, it is my 2nd post of THE DAY!!! Hmmm.... Will wonders never cease? Scroll down for the first post, OLW-7. Today is One Layer Wednesday, Week 8, Masking a Background over at Simplicity's blog. I needed a sympathy card, so I worked with it. And here it is. The flower image is from a Gina K set, Comfort & Peace, and the sentiment is from Amuse. My masked background is the result of using a Spellbinder's die, Labels 4. I used chalk again for the subtle background, because I couldn't find a complementary, pale ink in my stash that wouldn't overwhelm the delicate flower and sentiment. Love it! So simple and classy. I must get that Gina K set out to use. 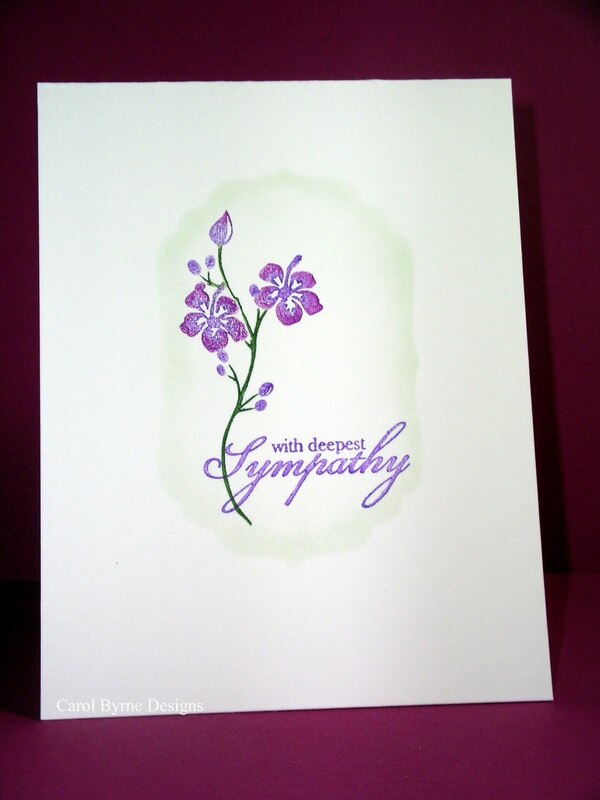 This is so beautiful - a lovely sympathy card! Carol, I'm so sorry you needed a sympathy card, and I know this one will convey your sentiments beautifully. Clean and simple and sincere and pretty. Hugs! 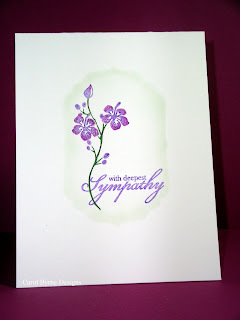 Needing a sympathy card is never good, but I'm sure the recipient will appreciate it. I love the softness...and your masking is so soft and subtle...love it! you did a great job of finding the right chalk to use with the mask. It shows off the flower perfectly without covering it up!! a beautiful card!! Beautiful job. Love that chalk treatment.